The ABG President Chief DR. JOHN MOMIS says that he will try to visit all Constituencies in 2018. 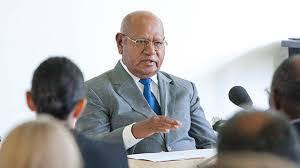 In his New Year Message to the people of Bougainville, PRESIDENT MOMIS said that he will make an attempt to visit all constituencies in the new years to make them aware of the coming Referendum scheduled for June 15th 2019. He said that he wants to personally involve in explaining to the people the importance of voting in the coming Referendum. The ABG President says he is not worried which ways the cookies crumble as long as the people know which way they have voted in the referendum. He says what happens later is up to the two governments to negotiate on how they can work on a transitional period. President Momis also said that all ABG members have been allocated funds for awareness in their respective constituencies in 2018.